Every investment/asset will have inherent risk that comes with it; no risk no reward. The amount of risk will vary with each asset. But no matter what kind of asset it is, there is always a chance of an asset bubble. An asset bubble is the result of human emotion in play in the markets. Investors get overzelous on an asset and become delusional in thinking that the sky is the limit, which creates sky high prices. But eventually, the bubble bursts. The most recent bubble burst is the real estate bubble. We saw it burst in 2007/2008 and it has only begun to recover. A lot of people lost a lot of money when that bubble bursted. 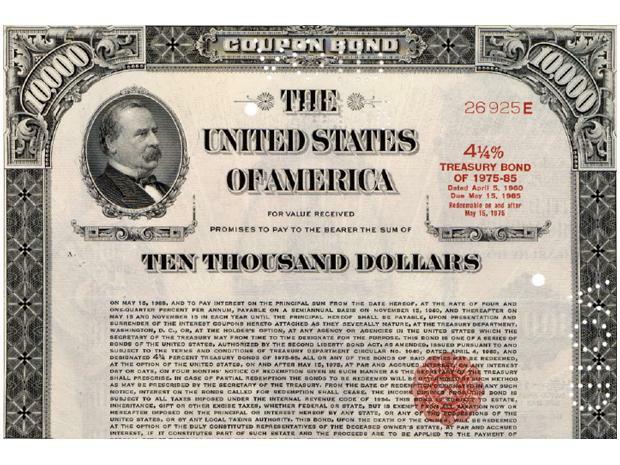 However, a few savvy investors saw the asset bubble coming and hedged against it. So if you want to protect your wealth or even make money when asset bubbles burst, learn to recognize the patterns in an asset bubble. In each asset bubble, there are four distinct phases, which are: Stealth, Awareness, Mania, and Blowoff. Stealth phase is the nascent beginnings of an asset being born. At this stage, only a small community of evangelists, hobbyists, and fanboys (or fangirls) know about the asset, its existence, and its potential value. This is where smart money put in their initial bets. For instance, early adopters (aka smart money) got in when the price of a bitcoin when it was under $100. As a matter of fact, it was just $8 three short years ago. The price went as high as $1,000 this past year. In the awareness phase, people with lots of money start becoming aware of the asset and its potential. In this phase, institutional investors (mutual funds, hedge funds, pension funds) come in and put a bet down. There will be a small selloff in this phase because many of the early adopters either want to take profit off the table or they are unsure how much higher it will go. But the decline will be small. At the end of the awareness phase is when the media starts picking up on the asset. Media attention marks the end of the Awareness phase and the beginning of the Mania phase. The media attention will attract a lot of attention from everyday Joes wanting to invest. With media attention comes a lot of speculation, good and bad. And as media attention attracts enthused buyers, the price will go up. 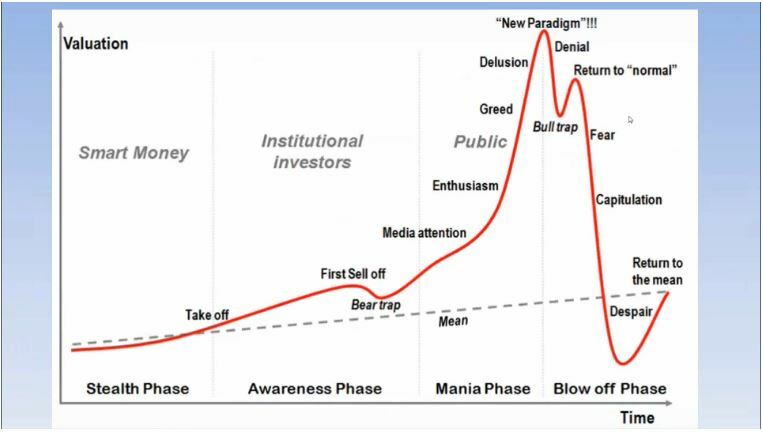 At the peak of the mania phase, many investors will invest based on the delusion that the asset will keep going up, forever. The blowoff phase is the asset bubble phase. The decline in price will start off slow; it may even increase a bit after an initial selloff. But as the selloff speeds up because of uncertainty and fear, so does the price decline of the asset. Selloff creates fear, which creates panic selling. Panic selling will cause a huge drop in the price of the asset. But eventually the selloff will reach a valley and then eventually return to their historical mean/average. Every time there is an asset bubble, delusional investors think it is going to be different this time around—that the bubble will not burst. Delusional investors are wrong almost every time. But just because you know a bubble is going to burst doesn’t mean you know when it will burst. Sadly, without hindsight, we are unable to know when the bubble will burst. While some people were able to predict the housing bubble bursting (since the early 2000s), the majority of investors were oblvious and the real estate market was in the Mania phase for awhile. After 2008, we were able to look at the overall picture to see when the mania ended and when the blowoff phase started. But without this hindsight, we would be unable to tell. But just being able to tell that there is an asset bubble forming will go a long way in helping protect your profits.